The Ride From Here to Kingdom Come! There was something for everyone, from distillery tours, The Kentucky Horse Park, Natural Bridge, Red River Gorge, rock climbing, whitewater rafting, Cumberland Falls, Kingdom Come State Park, Cave Run Lake, Martin Castle, Little Shepherds Trail, Carter Caves State Resort Park, Shaker Village, cave tours, Daniel Boone National Forest, Fort Boonesboro, to the Home of Bluegrass Music, as well as a one of the most beautifully preserved Victorian districts in the nation. Miles and miles of beautiful winding roads, the chance to ride the oldest continually operating ferry in the nation, visit your money at Fort Knox and stop by to watch an American legend, built daily. And how can you not want to visit Big Bone Lick State Park? Rally Central was at the Best Western Holiday Plaza in Richmond. The hotel has a HUGE swimming pool with sauna, workout room and a free full service breakfast consisting of gravy and biscuits, bacon, eggs, Belgium waffles, blueberry muffins, fruit and fruit cocktail, bagels, cream cheese, yogurt, oatmeal and grits, four cold cereals, three flavors of juice, coffee, milk, hot chocolate, and hot tea so come hungry! 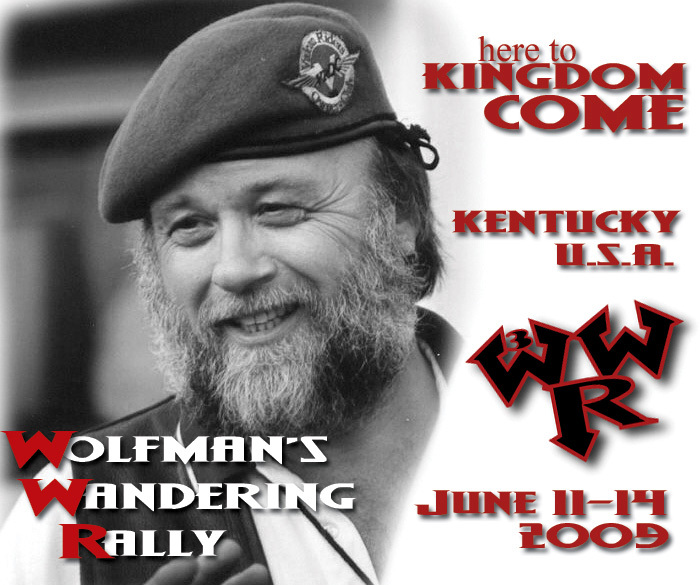 When you call 859-623-9220 to make your reservations, be sure to tell the manager you are with the Kingdom Come Rally to get the discounted rate of $69, $63 with AAA or AARP and $55 for active or retired military with military ID. Smoking and Non-Smoking rooms available. Cancellation is easy up to 24 hours before check in so call soon! 100 yards away from the Best Western is the Econolodge who also gave us a discounted rate of $44 for a double, but no free breakfast or WiFi. Call 859-623-8813 to get the discount. There are several other chain hotels nearby as well as a few nice bed & breakfasts. Excellent campgrounds are available at Ft. Boonesboro State Park, primitive and full hookups. Reservations available online. Waffle House is right next door to Rally Central and Hooters is right across the street. Outback, Applebee's, Cracker Barrel and Red Lobster are all close, as are other typical fast food joints including a Southeast original Krystal. Also nearby is a local landmark Hall's On the River, sit on the balcony overlooking the Kentucky River and try some fried banana peppers with beer cheese or wander next door to The Waterfront Bar & Grill where Bike Night is Thursday. After a tour of the winery, try a local bottle with dinner at Acres of Land's restaurant. In typical VROC Rally fashion, there were a few semi-organized rides but mostly just folks hooking up and heading off to explore the countryside. Kawasaki of Richmond is no longer in business but their Kaw mechanic John now works at I-75 Yamaha, plan accordingly. Honda riders have a local dealer available as well. 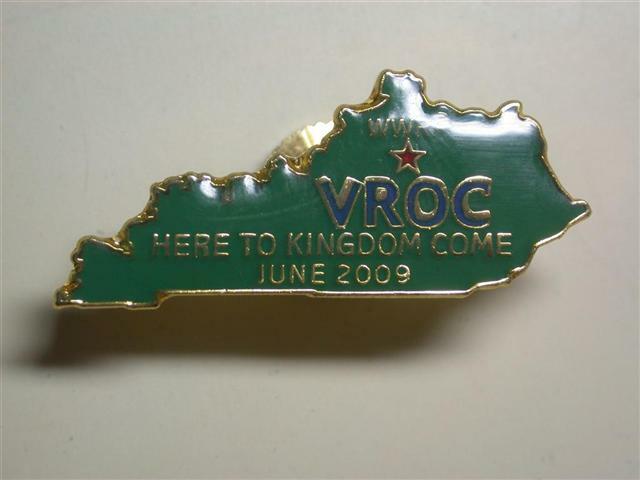 Tom has put together a blog with some candid shots of the area to give you a feel for summer in Kentucky. There was a catered dinner at the Best Western Friday with some wonderful homegrown Kentucky Barbeque but you MUST have EMailed Tom Miller by Tuesday the 2nd directly in order to secure your reservation! Tom has done a lot of research on this and the food will be awesome so be sure to contact Tom and bring cash for the caterers. You will supply your own drinks. Here is the full scoop: Brian's Hog Wild Barbecue will be catering the barbecue for us on FRIDAY evening around 6:00. He has won numerous awards for his barbecue, including four consecutive "Best of Nelson County" awards, which is where several large festivals are located, as well as most of the distilleries. Those folks are serious about barbecue. You may pick two sides from baked beans (excellent) green beans, slaw, or potato salad. 1/2 chicken added to a chicken or rib dinner is $8 and a 1/4 chicken is $5. Additional sides ADDED to a dinner are $1.50 each. Before you do the math, realize that the prices for dinners are in excess of the individual prices for add-ons. Please don't try to order individual sides or sandwiches without a meal to try and save a few bucks. Brian is giving us a discount for add-ons since he's recovering the price of delivering, setting up and serving the food in the meal price. And PLEASE be specific when you e-mail Tom for orders. Tom needs to know what sides you want and what meats. If there is any question of price please ask and Tom will give you an exact total. The portions are large, and the food is excellent. Tom initially thought this was a little high until he priced baby back ribs raw at the grocery. They have gone up considerably in the last year or so and are now around $12-$14 a rack raw. Wild Hog BBQ will supply the food, napkins, plates, utensils,they will setup the serving tables and bring a couple of people along to serve. All we have to do is enjoy. Again you MUST MUST MUST EMail Tom Miller for your reservation, and be sure and get confirmation back from him so there are no misunderstandings. You can make or cancel your reservation at any time up until June 3 but after that you'll be obligated to either pay for, or sell your reservation to someone else. If you don't pay it comes out of Tom's pocket and Denise needs new shoes. -grin- he'll pay the deposit and you'll pay for your meal as you get in line to eat. Tom needs to know what two sides you want, and what meat, and how many. Nite Lite is organizing a raffle after dinner Friday night! Bring donations with you or EMail Tony D. to arrange for a shipping address. This is a 50/50 raffle with the proceeds going to the Maxwell Dickerson Benefit Fund. The raffle will be held immediately following dinner Friday Night so hang around, you have to be there to win! Thanks to our friends at ROK for helping with a TON of donations for the raffle, Kawasaki's corporate support is most appreciated. Piper's AWESOME Rally T-shirts can now be ordered at Piper's website . Please order ASAP, as there is not much time until the deadline. Piper will only bring a couple of extras, so if you want to make sure you get one, it should be pre-ordered! Piper will be adding attendees names on the back of the shirt, based on the list on THIS website, not the VROC calendar and if you're reading this, the deadine to have you name added has passed. Pictures don't do justice to these finely crafted products. If you do not see your name here EMail Tony D. and he'll update it as time permits. A BIG thanks goes out to Tom & Denise Miller for taking the ball and running with this! More thanks to Philip & Jamie for helping out with the local contacts, and Craig Scott for Wolfman's logo! Ongoing thanks goes to our riding Realtor: Anthony Drager MidWest Realty for hosting this site year after year. 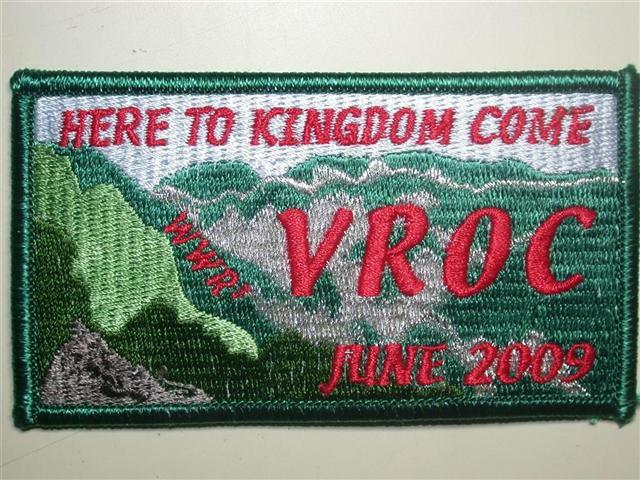 For those new to VROC, WWR³ is an annual event honoring the memory of Rick "Wolfman" Jakubas, developer of our web site and all around great guy. Read up a bit for a little better understanding of this man and his legacy.